Viewing 1 current event matching “craft” by Date. Viewing 33 past events matching “craft” by Date. We’re thrilled (get it?) to announce a special collection of upcoming classes to get you in gear for all your upcoming Halloween festivities. Join us on Saturday, October 22, for the opportunity to make your own electrifying decorations and gear, troubleshoot and complete your own DIY costumes, and craft your own piñata from found materials. Read on to learn more and get involved! 10am-1pm: Electrifying eTextiles Halloween Workshop $50 (includes all materials) – Up to 20 students Create a spooky light-up fabric decoration for your wall or door! In this workshop we’ll use Aniomagic’s Sparkle platform to sew LED Halloween decorations that respond to ambient light levels. 11am-2pm: Conquer Your DIY Costume: Troubleshooting & Handholding Session $25 – Up to 8 students Are you interested in making your own crazy Halloween costume but don’t know where to start? Or, perhaps you have everything you need BUT that sparkly superhero cape? Expert seamstress ElizaBeth Rohloff is offering hands-on sessions to help work through your project. She’ll be available to talk through your plans, help recommend fabrics, and come up with easy and cost-effective solutions to help bring your vision to life! 1:30-4:30pm: Create Your Own Halloween Piñata! $25 – Up to 8 students Explore the Zen of Pñata-making with instructor Julian Ansell, using materials harvested from Portland’s poster-laden telephone poles (and for the same price as buying a Piñata from Wal-mart!). Instruction and construction will take place from 1:30-4:30pm, but participants are welcome to continue work at any time during ADX operating hours if they’d like more time to perfect their pieces. Nov 13, 2013 Plastic Fantastic! On a planet drowning in plastic, its time to learn how to swim. Join us for a night of hands-on, computer-free plastic working. Make your own rubber stamps! Turn leftover UV-curing acrylurethane "rubber" into ink-pad stamps with our DIY UV development box. Customize kitchen gadgets and fix things! Learn to hand work medical-grade, biodegradable polycaprolactone, help make a custom funnel for a RoboCoupe food processor, and learn how to use this plastic to fix and hack broken things. Weld plastic bags into new things! Hands-on heat tools available for patching together thin plastics and joining plastic bags. Learn to make balloons and turn old plastic bags into thick sheets of recycled plastic textiles. 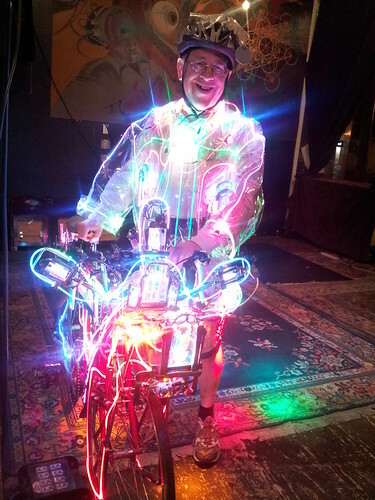 Mark Allyn will be showing off his custom glowing raincoats and talk about putting the fab in vinyl fabrication. Interested in wearable and physical computing, and crafts? Have some projects you'd like to work on, but could benefit from a creative atmosphere? OSH Park, Cacophonous Creations and Flux Lab team up to offer just the space! You bring your projects and supplies. We will supply wifi, and a place to share ideas and collaborate with a community of fellow creators and makers. We can answer some of your soft circuit questions, share tips and tricks, and support your creative endeavors! Things to note: *This is an alcohol free, all ages space. *Some components will be available for purchase. Please contact Cat ([email protected]) if there's something specific you want available for your project. *While this is a free event, we will be setting out a tip jar to help raise funds to cover the costs of hosting this awesome bi-weekly event. Interested in wearable and physical computing, and crafts? Have some projects you'd like to work on, but could benefit from a creative atmosphere? OSH Park, Cacophonous Creations, and Flux Lab team up to offer just the space! *This is an alcohol free, all ages space. Have some projects you'd like to work on, but could benefit from a creative atmosphere? OSH Park, Cacophonous Creations, and Flux Lab team up to offer just the space! *If there's something specific you want available for your project. Have some projects you'd like to work on, but could benefit from a creative atmosphere? OSH Park and CymaSpace team up to offer just the space! Have some projects you'd like to create? Looking to collaborate with someone on something awesome? Could you benefit from a creative atmosphere? OSH Park and CymaSpace team up to offer just the space!